Okay, this is a recipe I made up on the spot. This is one of my favourite things to do. I must admit, sometimes it goes badly. But sometimes, mmmmm delicious! With soups it's pretty easy, as long as you have most (some) of the base ingredients: onion, celery, carrot, garlic, parsley. You can add almost anything to this, with water to cover, and you've got soup! Here's what I did. Roughly cut up 3/4 of the onion and 2 cloves garlic. Cube the butternut squash, parsnip, yellow beet, 3 carrots into approximately equal sized pieces. 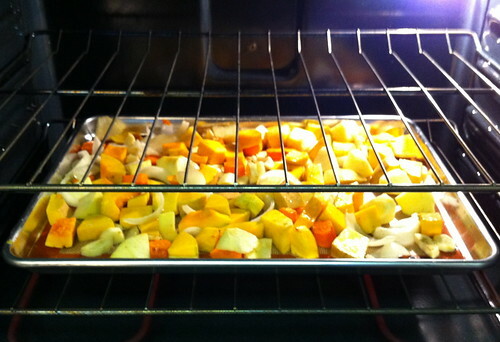 Toss the veggies, onion and garlic with 2 tbsp coconut oil, spread out onto a baking sheet, roast in the oven for 45min. While veggies are roasting, put together your soup base in a big deep pot. Start by warming the rest of the coconut oil, add the rest of the onion, garlic, carrots. 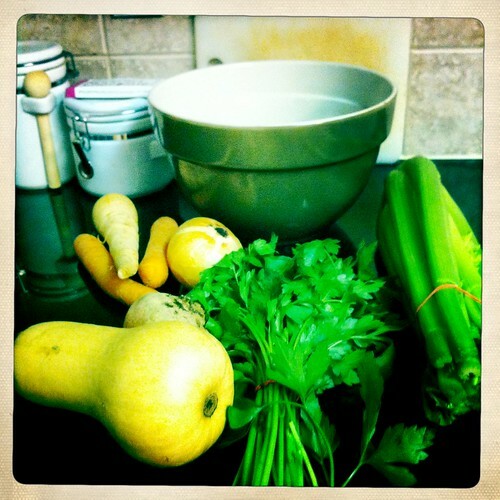 Roughly cut and add the celery stalks (including leafy ends) and sweat the veggies for a few minutes. Add the parsley and mix it through, continue to sweat the veggies for another few minutes. Once the roast veggies are done, add them to your soup base. Cover with water until it come about 1/2 inch above the veggies. Add the bay leaves, cinnamon, and nutmeg. Simmer for 1-2 hours, salt and pepper to your desire! 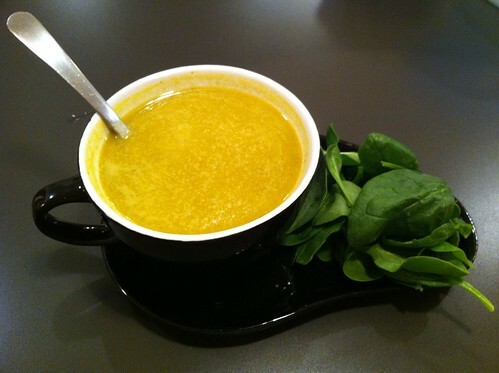 Transfer the soup into a deep ceramic bowl and blend until smooth with a hand blender. I like to make soups like this in nice big batches, freeze some and take some to work to enjoy with a salad for lunch. 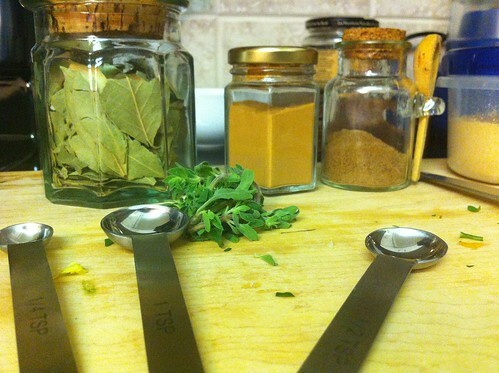 It's a great way to get in a healthy hot meal during fall and winter!